Instructions 1. In a large pot, brown onion, garlic, turkey and beef. Drain any fat. 2. Stir in chopped cabbage, carrots and celery. Let cook until slightly softened (about 3 minutes). 3. Add all remaining ingredients, bring to a boil and reduce heat to medium low. Cover and simmer on low until rice is fully cooked (about 30 minutes). 4. Let simmer to develop flavor for as long as you want. Just don’t reduce all the liquid away. Remove bay leaf. 5. Serve with a lemon wedge to squeeze over bowl of hot soup. Enjoy! 1. In a large bowl, combine the flours, sugar, baking soda and salt; cut in butter with a fork. 2. Stir in buttermilk just until moistened. Fold in currants. 3. Knead on a floured surface 8-10 times. 4. Shape into a 7-in. round loaf; place on a baking sheet coated with cooking spray. 5. Bake at 375° for 20-25 minutes or until a toothpick inserted near the center comes out clean. Remove from pan to a wire rack. 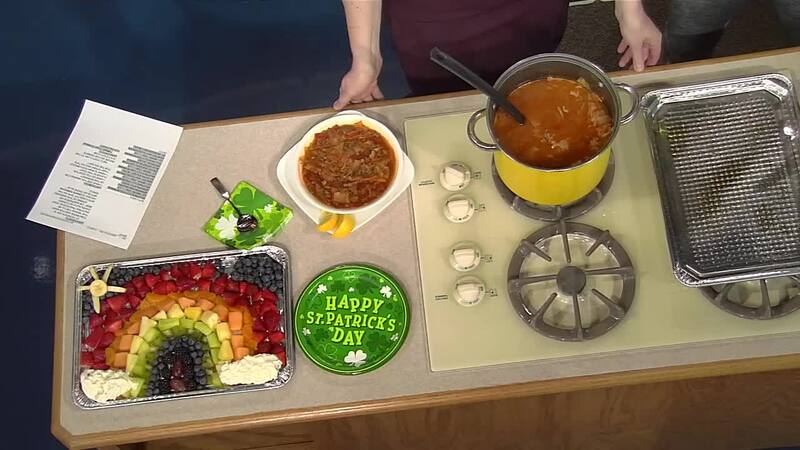 Delicious when served with unstuffed cabbage soup or Irish beef stew. Enjoy!